We are a leading Manufacturer of passenger step ladder from Mumbai, India. 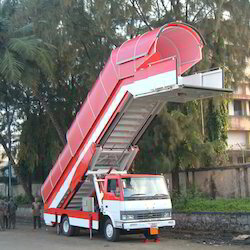 NANDAN’s Passenger Step Ladder (Aircraft passenger steps or Aircraft Passenger Stair Truck) are used for em planning and deplaning of passengers, we are the trusted name in the manufacturing of passenger step ladders that are fabricated in compliance with set international standards using graded raw material. The narrow body version of the step ladder mounted on a 6 ton GVW chassis can cater to most domestic aircraft with sill heights from 2450mm to 3800mm. The Universal version can do aircrafts from B 737 to A 340/ B747 with sill heights from 2700mm to 5600mm. These ladders are provided with rounded polycarbonate canopy, thermogrip handrails, aluminum paneling and energy saving hydraulic circuit. Easy to install and operate, comes in Towable and Self-propelled versions with Advanced hydraulic technology and components, elegant in design, sturdy outlook and rugged in construction are utilized to provide reliable performance and easy maintenance. Nandan also offers electric operated Self-propelled step ladder as part of the BLUE GSE.